Twitter sometimes starts conversations you don’t expect.Which in turn can produce unexpected, real-world results. 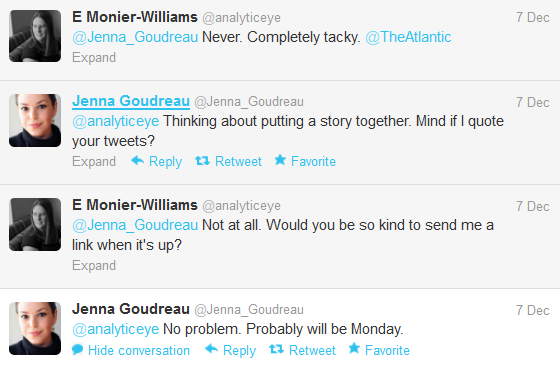 The other day, I noticed an interesting tweet from @Jenna_Goudreau who writes for @Forbes and @Forbes Woman. As a result, she asked for permission to quote our very brief conversation. 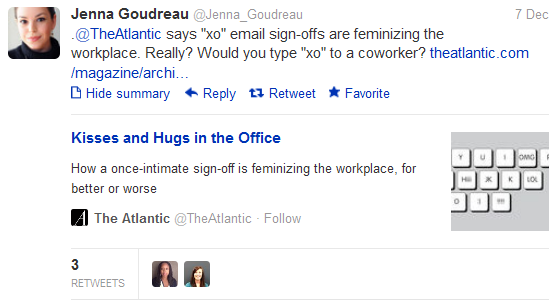 Her article, “XOXOXO: Are ‘Hugs And Kisses’ To Coworkers Ever Appropriate? – Forbes” came out on Monday. And low and behold, I was quoted. I’ve never met Goudreau. We don’t live in the same country, let alone the same city. If I needed more than one hand to count our Twitter exchanges, I would be surprised. But this is the kind of immediate reach the Twitter platform provides, particularly if you’re interested in connecting with journalists. I didn’t know Goudreau was writing a response to The Atlantic piece. I just thought it was an interesting conversation and jumped in. The last three exchanges I had with journalists as part of my duties for MaRS Innovation were all done through Twitter. So, do you use Twitter? If you don’t and you work in communications or marketing, consider this a tiny example of the dialogue you’re missing. But in all seriousness, there are coworker friends whose xo I probably wouldn’t notice, and those (my Dean for example) that would make me fall off my chair. I’ve been tempted, when someone goes above and beyond the call of duty to help me out of a work crisis, to send my hugs – but now that this article makes me think about it, I do usually hold back. Writers can be a weird sort – when you make professional work product out of your most intimate messes, it can make boundaries funny. There’s a lot of collegial writerly xo’ing out there. But yes, as much as I bristle at the feminizing comment, it does tend to be amongst the ladies. The men just call each other douche and bro in alternating tones of social media affection. I understand other working cultures (e.g., the arts) can be different, but in a corporate culture, it’s a no-go to me. People have worked too hard to get casual sexism not okay in conversation for me to want to see this become widespread. If someone I was friends with outside of work used it, I probably also would not notice. But when power is involved, it can also read as condescending. Blows my mind that women running large organizations would go there.